Mooresville join forces to become Top Micro. f having one Top Small Town is great for a county, then having two is better. Just ask the folks in Iredell County, N.C.
By registering 24 new and expanded corporate facility projects in 2004, the Statesville- Mooresville, N.C., Micro-politan Statistical Area claimed Site Selection's Top Micropolitan of the Year award. Formerly called the Top Small Town award, the ranking this year takes on the new designation due to the way the U.S. Census Bureau now tracks rural economies. Once looked upon as quasi-rural areas, a micropolitan area must include a city of at least 10,000 people but less than 50,000 and cover at least one county, according to the Census Bureau. Among the 3,142 counties in the U.S., 674 are included in the newly designated micropolitan areas. A micro is a largely self-sufficient, rural, regional economy. Most of the people who live in micros commute to jobs that are based in the micro. If a majority of county residents start to commute out of the county into more urbanized areas, then this county is normally lumped into a larger Metropolitan Statistical Area  such as Atlanta, Charlotte or Dallas-Fort Worth. That is not the case in Iredell County, where both Statesville and Mooresville have taken turns in previous years as the Top Small Town in America, based upon their respective corporate facility tallies. In 2004, by being classified as one self-sustaining micro, Statesville and Mooresville morphed into what amounted to a "small-town" juggernaut. Statesville-Mooresville topped the chart of corporate facilities with 24 projects in 2004, ahead of No. 2 micro Traverse City, Mich., which had 20 projects, and No. 3 Cullman, Ala., which had 18. The $27-million expansion in Mooresville by Ngk Ceramics Inc. was among the Top Micro's largest projects of 2004. 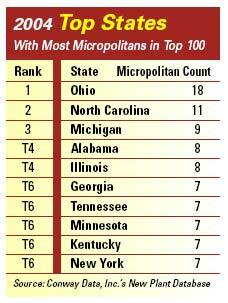 Also in the Top Ten Micros of 2004 were Plattsburgh, N.Y. (15 projects), Hutchinson, Kan. (15), Tupelo, Miss. (14), Batavia, N.Y. (12), Lexington-Thomasville, N.C. (11), Paducah, Ky.-Ill. (10), Zanesville, Ohio (10) and Albert Lea, Minn. (10). 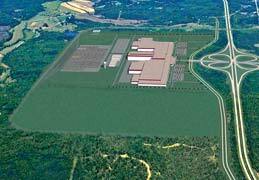 Among the largest projects in Statesville-Mooresville last year were the $27-million, 89,000-sq.-ft. (8,268-sq.- m.) expansion of Ngk Ceramics Inc. in Mooresville and the $9- million, 90,000-sq.-ft. (8,361-sq.-m.) hangar facility for Lowe's Company Inc. at the Statesville Regional Airport. The largest job announcement was the new La-Z-Boy distribution hub in Statesville, expected to create as many as 100 new jobs in northern Iredell County. One of the world's largest furniture makers closed on the $17-million deal in the Sherrill Industrial Park to establish a 639,000-sq.-ft. (59,363-sq.-m.) warehouse. La-Z-Boy is taking over a facility that Garden Ridge used for its Southeastern distribution headquarters until April 2004. A $2-billion company, La-Z-Boy will occupy 42 acres (17 hectares) in the 208-acre (84- hectare) business park on U.S. Highway 70 just east of Interstate 77. Jeff McKay, executive director of the Greater Statesville Development Corp., said his community's location at the crossroads of I-77 and I-40, about 35 miles (56 km.) north of Charlotte and just 45 minutes from Winston-Salem, is a big reason why companies choose Statesville. "The obvious growth factor here is our location, but our community leaders also made a statement several years ago to promote a strong business base," McKay says. "That is reflected in the policies we enact and our expenditure of public funds. Our taxation policy is very conducive to business growth. We've chosen to grow our tax base rather than tax our citizens more." A $9-million, 90,000-sq.-ft. (8,361-sq.-m.) hangar at Statesville Regional Airport (top) is the latest good news from Lowe's. 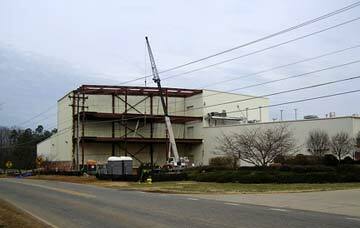 Structural tubing maker TubeTec's facility (below) represented the first tenancy at the East Iredell Business Park in 1999.
airport by expanding the runway and installing a full instrument system. The airport expansion is allowing Lowe's to locate its entire corporate fleet at a new on- site hangar. When Lowe's is done, it will have spent $100 million on its facilities at the airport, says McKay. Down the road 15 miles (24 km.) at Mooresville, economic developer Melanie O'Connell Underwood saw 1.4 million sq. ft. (130,060 sq. m.) of new commercial and industrial space added to the market in 2004. "New development is going up faster than we can track it," Underwood says. The rapid growth of the NASCAR motorsports industry and the new Lowe's corporate headquarters are bringing suppliers in a variety of industries to town. "This is really the story of how a town transformed itself from a textile community into one that has no textiles at all but has two very strong industries  motorsports and Lowe's," she says. "We lost our main industry but not our independence." Burlington closed its doors in 1999 just three months after Mooresville lost its other main textile company, displacing a total of 1,400 workers. "Our unemployment rate didn't even go up," Underwood says. "We gained jobs." The job growth was the direct result of a diversification strategy adopted by city leaders. "The town fathers in the early 1980s made a decision to diversify the tax base and replace the textile jobs that were leaving," adds Underwood. "They preserved land for industrial parks." The results speak for themselves. Since 1995, the town now known as Race City USA has added more than $1.1 billion in new industrial development. Mooresville's population has doubled and its unemployment rate has declined. MICRO DOESN'T MEAN SMALL: Created by a partnership of Pontotoc, Union and Lee counties, this 1,200-acre (486-hectare) site near Tupelo, Miss., recently became the fourth site certified by McCallum Sweeney as part of the Tennessee Valley Authority's "megasite" program. "This  was our third biggest year ever, and the outlook for 2005 is excellent," Underwood says. "We've already had six corporate facility announcements since Jan. 1." How does a small town become part of a Top Micro? The Community Development Foundation of Tupelo, Miss., wanted to itemize the keys to its long-term economic success, so it commissioned a study to find them. The community prospers only to the extent that individuals prosper. Organizations, programs and projects should provide opportunities for individuals to grow and develop. Community development must precede or, at least, parallel economic development. People want to work and live in a complete community. Key organizations can paint a vision with strategic plans, but implementing these overall plans requires specific projects and programs. Success not only breeds more success; it also breeds more organizations, projects and programs designed to enrich the community. Newcomers to the area should be embraced and encouraged to become involved with community-building organizations. Community development is hard, but rewarding, work. To be successful, a community must be committed to excellence in every phase of community life and realize that this is a long-term, never-ending process. David Rumbarger, president and CEO of the Community Development Foundation, says that the underlying foundation for these six core principles is the "culture of reinvestment" that pervades Tupelo and Lee County. "Most of our expansions are due to this philosophy and the work-force development program in Tupelo and Lee County," Rumbarger says. "We have a great location in the middle of the southern automotive corridor in the U.S. In fact, one out of every three projects we landed last year had an automotive slant." One of the largest is from Cooper Tire and Rubber Co., which is adding 30 jobs and 23,000 sq. ft. (2,139 sq. m.) of new plant space as part of its $10-million investment to produce more steel-belted radial tires. The company originally purchased a 635,000-sq.-ft. (58,992-sq.-m.) building in Tupelo in 1983 and began operations in 1984. In 2003, Cooper launched a major expansion to add 160 jobs and $7.5 million in new capital spending. Today, the plant has 1.4 million sq. ft. (130,060 sq. m.), a work force of more than 1,500 and an annual payroll of more than $73 million. Rumbarger says that the region's strong clusters in machine tools, metals and motor- driven products all contribute to luring new automotive plants. "Over the next five years, we expect to grow even faster than we have in the previous five," Rumbarger says. Rumbarger says new commercial construction in the county was up by 40.6 percent in 2004, adding more than 190,000 sq. ft. (17,651 sq. m.) of new space to this micro's market. "I really have to go back to the leadership that exists in this community," he adds. "They are very active in the community, and it's been that way for the past 100 years." ©2005 Conway Data, Inc. All rights reserved. SiteNet data is from many sources and not warranted to be accurate or current.